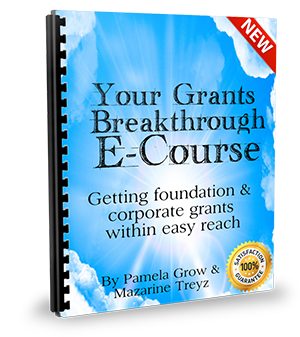 Would you like to get foundation and corporate grants within easy reach? 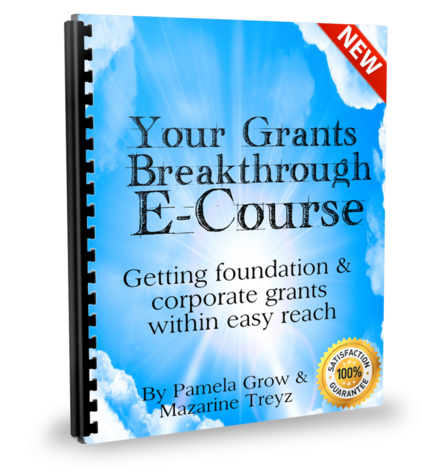 Are you tired of trying to get foundation or corporate grants? Do you write the LOIs, and just get silence in return? Are you unsure how to get grants for your operating costs? I was once just like you. I am about to tell you a true story. When I first started fundraising, I was in a hot spot. Around the equator actually. I was working at a nonprofit that helped people in Jakarta, Indonesia’s poorest slums with mobile health clinics. Our work was to go to these slums in the early morning, set up our tent, and start parceling out medicine into little plastic bags while the doctor started seeing a long line of people. Even a group of three children came to get a checkup. Some of the patients needed more help than we could give them. There was a man with an undiagnosed heart problem who had to be sent immediately to the hospital. I saw a man trying to cover up the fact that all of his skin was flaking off. Then there were the people with syphilis, with just one or two toes, with a stump for a hand or just two fingers. Their mottled flesh was just falling off their bodies. The people I saw, I will never forget. How did Indonesia get in your grant problems? Let me explain. How wrong I was! (But that’s another story.) When I got back to the states, I decided I would start fundraising. I took a couple of courses on grantwriting at the foundation center and started to research and write grants for a couple of tiny nonprofits. Did we get any of those grants? Nope. Why not? Read on. I didn’t know the secrets to getting grants. I didn’t know how to really research grants, the different combinations of words to use, which databases to use, how to use annual reports to research grants, and how to create relationships with foundation staff. I didn’t know about approaching corporations, getting corporate volunteers, and then getting corporate grants. Over the years since then, I’ve worked at nonprofits and been able to research, write, and receive hundreds of thousands of dollars in foundation and corporate grants for causes like domestic violence, social justice, arts nonprofits, and more. It took me years to really figure out how to write grants. I’m teaming up with Pamela Grow. She writes Pamela’s Grantwriting blog, and for 10 years she worked at a foundation, reading LOIs, proposals, grant reports and more. She knows what it takes to help nonprofits succeed in getting grants. When it comes to the other side of the table, she knows what funders want. 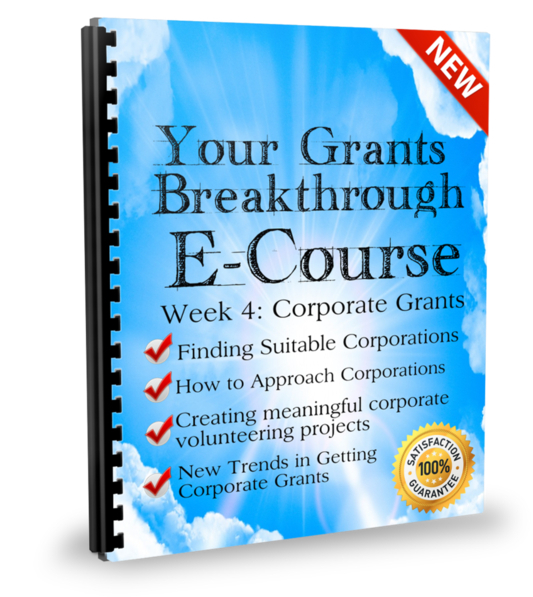 Together we’ve created a 4 week e-course to help you get the grants you deserve for your cause. 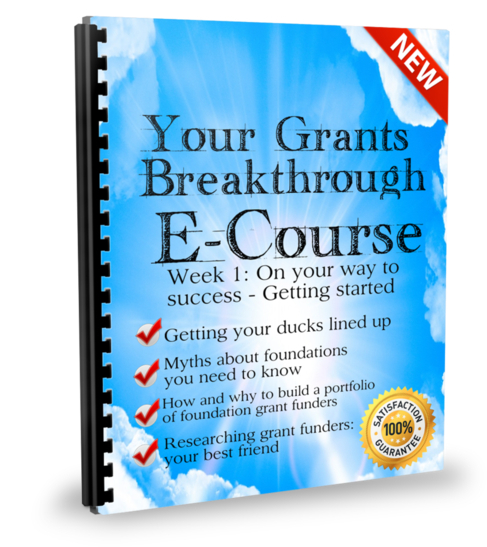 If you’ve been unsuccessful in getting grants so far, you need a grants breakthrough. If you’d like to get more grants than you’ve ever gotten before, or if you’d just like a refresher on how to get grants, this course is for you. Our four-week e-course covers how to get more grants funding, year after year. Here’s what you can expect. 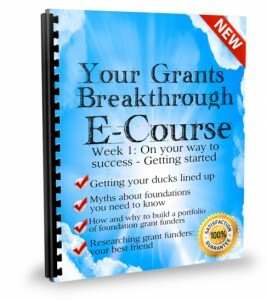 Getting your ducks lined up: are you ready for foundation grant funding? Are you missing this key ingredient? Week Three: Rinse and Repeat! 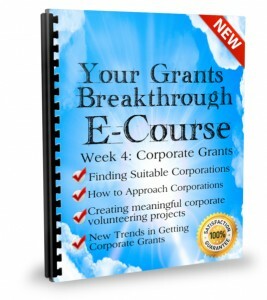 This course could be just what you need to get your foot in the door with funders. Just think. With your first grant that you get based on these techniques, you will EASILY make back your investment ten times over. 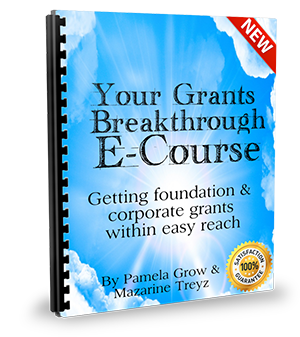 I can’t wait to teach you the secrets it took me years to learn, and give you a grants breakthrough of your own! An e-course is written material, sent to you every week, in a printable format. It will also include a recorded webinar. We created this format so that you can go at your own pace, and fit the e-course into your busy schedule. When you buy this product, you will be placed on an email list that will email you the product, one week at a time. You will not be placed on any other list, and once the course is over you will get no further emails from us. One person asked, is it a live webinar that I’ll need to login to attend? It is not a live webinar. Because of everyone’s busy schedules, we are making this e-course of written material, so that you can learn this information exactly when it is convenient for you. How long will the course take me to complete? The course will take roughly 2 hours a week. There’s also a recorded webinar that may take a little more time. Will there be printable materials? Yes! Every week you will get an email with an attached pdf that you can print and put into a binder. Will there be any opportunities to ask questions? Absolutely! You can email me unlimited emails for the duration of the course. Will there be practice exercises to complete? Yes, there will be practice exercises to complete. I include worksheets and templates in all of my webinars and e-courses. I believe that if you apply your learning instantly, then it sticks! YES! If you are not satisfied for any reason, I offer a 30 day money-back guarantee. 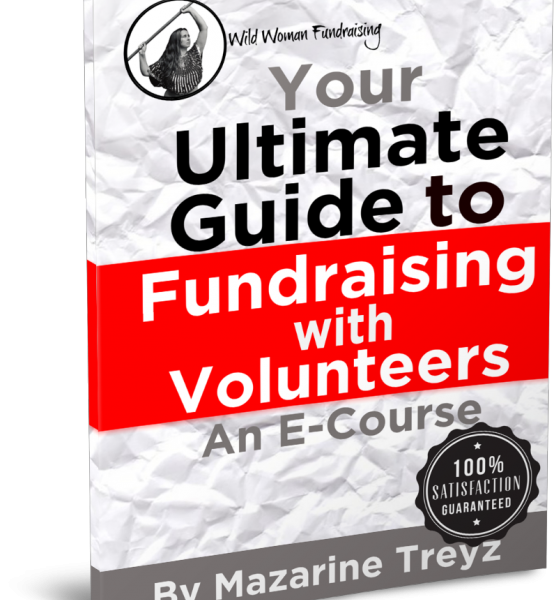 Mazarine Treyz, BA, (Bard College), is the author of the popular Wild Woman’s Guide to Fundraising. Her book was named as one of the Top 10 books of 2010 by Beth Kanter, CEO of Zoetica and author of The Networked Nonprofit. In 2003 Mazarine wrote her first grants for Indonesian nonprofit Yayasan Emmanuel. In 2005 she co-founded a nonprofit called “The Moon Balloon Project” on the south shore of Boston, MA. 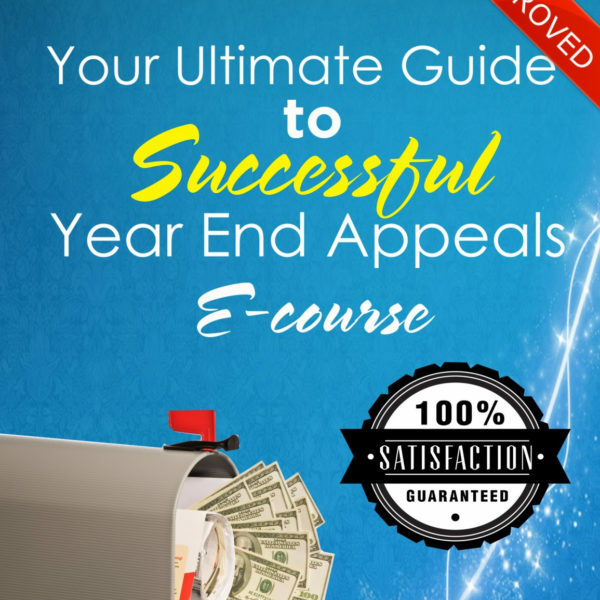 Since that time she has raised over $1M for various local, national, and international nonprofits with appeals, emails, grants, sponsorships, and more. Texas Association for Nonprofit Organizations (TANO) (2010) and more. Ms. Treyz has taught hundreds of national and international nonprofits how to fundraise since 2009. Ms. Treyz created the first Fundraising Android Apps in 2010. In 2012 she published The Wild Woman’s Guide to Social Media, which got a 5 star rating from Nonprofit.About.com in 2013. In 2013 she published Get the Job! 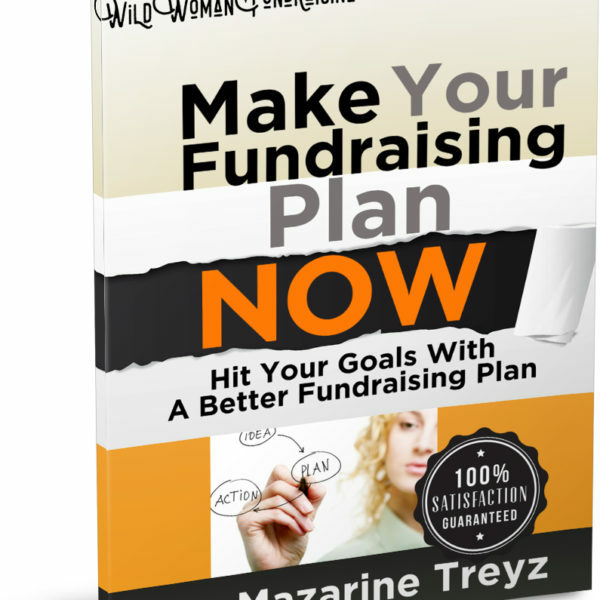 Your Fundraising Career Empowerment Guide, which also got a 5 star rating from Nonprofit.About.com.